How many times can an artist deconstruct his craft and still surprise us? How often can a magician reveal his illusions and still leave us flummoxed? This is the challenge facing M. Night Shyamalan, Hollywood’s most esoteric trickster, as he burrows ever deeper into the cocoon of his cinematic universe, not so much playing to mainstream audiences as to film theorists, comic book geeks and cult-cinema subreddits. A thousand years ago, he was an Oscar nominee, a director of prestige thrillers. But at least since Lady in the Water, his winking comedies have attempted the dramaturgical acrobatics of forecasting his infamous twists and shocking us with them nonetheless, jettisoning narrative gravity for the balm of fanboy metafiction. But none of Shyamalan’s self-conscious experiments have been quite as inside baseball as Glass, a patchwork quilt of his previous films stitched together with cheeky comic-book structuralism, the jittery mythos of mental-asylum entertainment — think Twelve Monkeys, American Horror Story: Asylum — and crackpot conspiracy theories. It is Shyalaman playing to his base, and nobody else. Glass begins more or less where 2016’s Split left off. James McAvoy, in a performance as bonkers as it is bravura, returns as Kevin, the psychologically damaged former zoo employee with a case of multiple-personality disorder so extreme he can change his physical form — most dangerously into “The Beast,” a predatory-animal hybrid with bulging musculature and super-speed. Also returning from the Shyamalan oeuvre is Bruce Willis’ David Dunn, whose curious cameo at the end of Split begins to gel. Having acquired touch-based ESP and super-strength after surviving the train derailment in Unbreakable, David manages his home-security business by day, and travels the streets in a green raincoat at night, dispatching evildoers under the cloak of his alter ego, The Overseer. With some help from a black-market police scanner operated by his tech-friendly son Joseph (Spencer Treat Clark), David discovers Kevin in an abandoned warehouse, where the Beast is up to its old tricks, namely the abduction of cheerleaders. These two strongmen tussle for a spell, only to be apprehended by a new character in the Shyamalan bubble: Sarah Paulson’s Dr. Ellie Staple, a psychologist with a hilariously specific subspecialty. She studies delusions of grandeur in which psychotic patients believe they are superheroes. Having captured two ideal subjects in one fell swoop, Dr. Staple carts them away to a sanitarium, where David and Kevin join a fellow “superhero” already under her care: Elijah Price, Samuel L. Jackson’s brittle-boned, wheelchair-bound mastermind from Unbreakable, now rendered catatonic, expressionless except for the occasional twitch of the eye and mouth. There’s dry irony in Jackson embodying this role so well — in Shyalaman rendering mute, at least for a time, one of cinema’s most loquacious actors. It’s one of many inside jokes. 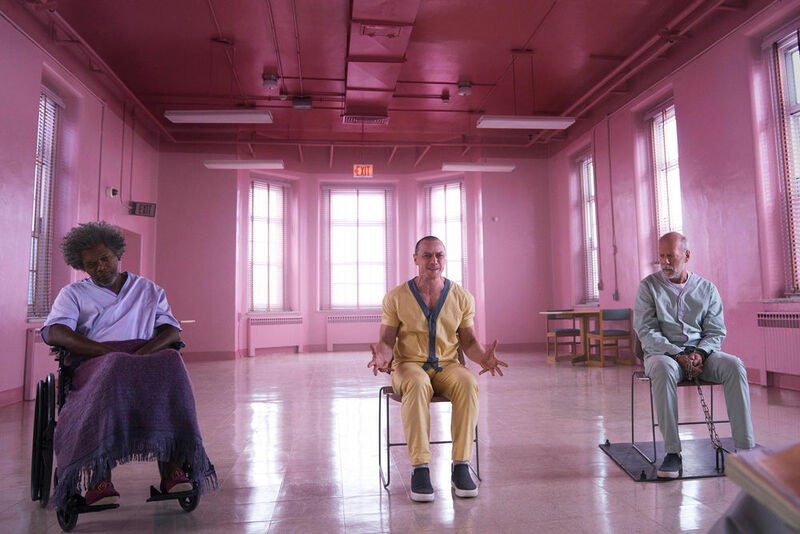 When this dialectic eventually runs out of steam, Shyamalan relies on old saws: the comic-book schematics recycled from Unbreakable and hammered ad nauseam, McAvoy’s Man of a Thousand Faces replicating his schizoid shtick. But at least McAvoy appears committed to the project: Willis’s performance is practically somnambulant, the epitome of a onetime A-lister picking up a paycheck. Despite my best critical judgment, I rather liked the requisite third-act changeup, which can be read in multiple ways. At its core, it suggests that immutable truth can never be suppressed, even if it takes sacrifice to reveal it — a patriotic message in today’s political climate. One of my fellow critics told me he saw God in the finale, a perception that’s equally defensible. In its totality, though, Glass is the guiltiest of pleasures, a loose three-quel that’s more of a rehash than an expansion of the product that preceded it. If Shyamalan wants to be more than the auteur of the comic-con, it’s time for something new.